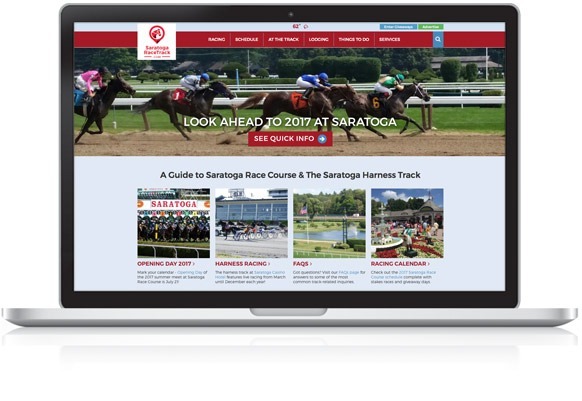 As the unofficial guide to the Saratoga Race Course, this trusted resource for all things track-related, from events & giveaways to lodging & dining is viewed nearly 2 million times a year, with peak traffic in July thru September. Every summer, thousands of visitors flock to the region to witness exciting thoroughbred horse racing on the Flat Track, using SaratogaRaceTrack.com to help them find places to stay, things to do, restaurants to dine at and more. And, while traffic spikes during racing season, many visitors plan their trip to the track months in advance, making this site a steady source of trusted information year-round. Take advantage of targeted cost-effective marketing options on SaratogaRaceTrack.com and get ready for traffic! Are you looking for a cost effective way to reach a wider audience? Did you know advertising and marketing your business with SaratogaRaceTrack.com is often times the most affordable, yet highly successful solution in your marketing mix. Mannix Marketing is a great team of folks who do excellent work. We get found easily and it is seen in our business as we have grown substantially ever since we started doing business with Mannix. Mannix Marketing transformed our old website into a mobile-friendly responsive website with an inviting modern design. We are impressed by how easy it is to communicate with the experts at Mannix. They listen, spend time understanding our needs and spare us unnecessary tech jargon. The entire process was about as stress-free as it could possibly be. The customer-focused changes have greatly improved the online experience. It’s only been two months, but already analytics show visitors are more engaged, and our bounce rate has decreased by 15%. We’ve even seen an increase in the number of online job applications. We can recommend Mannix without reservation.